It didn’t really feel like ‘Christmas time’ until today. We received our first Christmas card in the mail the other day and we’re going to our first Christmas party tonight! We’re also co-hosting a christmas party at our place Monday night for our neighbours. We even have some more lights on our tree after every hardware store seemed to sell out of lights before December 6th this year. Luckily Adam was able to find some more yesterday so our rather large tree could really be lit up. So now all our decorations are up now and we’re ready to go. I spent about 6 hours in the kitchen yesterday baking, as well as a few nights last week. I wanted to get it all done and put away so I could just pull out the treats when I needed to. Also, I tend to make a rather large mess when baking so my philosophy is do it all now, make one big mess and then it’s done. Makes sense – right? These are one of my favourite cookies to make. 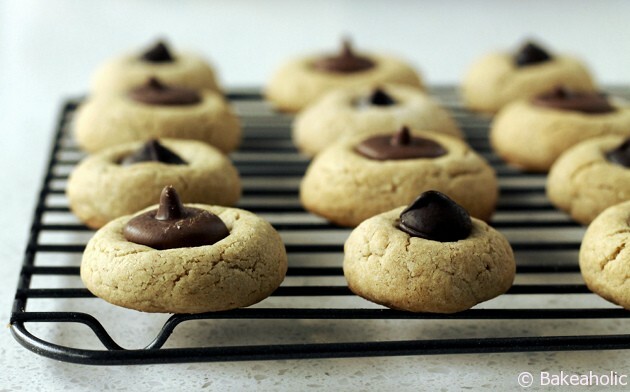 Since I have a slight peanut allergy, along with many other people, I switched these traditional peanut butter blossoms to almond butter and swapped the hershey’s kisses out for extra large dark chocolate chips. I still made a few with the Hershey’s milk chocolate kisses, although they were so melted that they lost their shape. They still taste delicious, and that’s what really matters. This recipes makes a large batch because I like to make the cookies smaller than usual. I find that when I’m at a party I like to taste everything – and having a full size cookie or treat limits how many you can try. Plus when they are really decadent or sweet a big piece can send you over the edge. WIth the large dark chocolate chips the cookie itself can be smaller, and the chips are the perfect size. I always make smaller versions of desserts or cookies for when I’m making a platter or bringing them somewhere so that people can have a little bit of everything. Or you can go ahead and eat 4 or 5, it’s the holidays! I’ll be posting a new holiday recipe each day until Christmas. These are one of my favourites – really anything with nut butter and chocolate. What about you?? 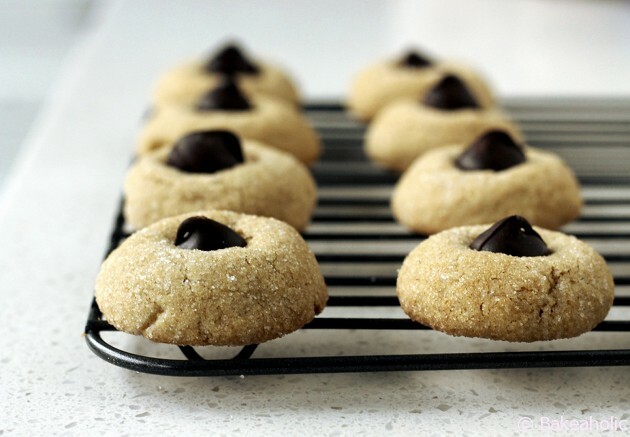 Soft almond butter cookies studded with dark chocolate chips - like the peanut butter blossoms, but peanut-free. 2. In stand mixer cream together butter, almond butter, brown sugar, and sugar until smooth. Add in the eggs one at a time, beating until fully incorporated. Mix in a couple splashes of Almond milk and 2 tsp vanilla. 3. On low speed add in flour one cup at a time, and baking soda. Mix until incorporated. Dough should come together, and be a little bit sticky but easily able to shape. Add more flour a tablespoon at a time if too thin. 5. Bake in preheated oven for 10 to12 minutes. Remove from oven, and immediately press a jumbo chocolate chip or chocolate kiss into each cookie. Allow to cool completely, so the chocolate hardens before storing.